Every year, I draft a grand to-do list for backyard projects. And — every year — I barely cross even a few items off this list. Usually my goals are too lofty. Or maybe some of them are frankly too expensive. Whatever the case, I've found the solution. These easy (and cheap) DIY projects are novice-friendly and will transform your outdoor spaces from blah to beautiful. Here's yet another awesome use for wood pallets — make a deck! Pick up however many pallets you want for the size of your deck. Then clean them up, sand them down, and paint for a durable finish. 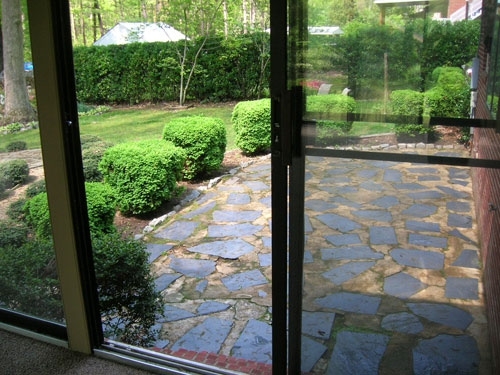 Clear the area you want to stage by removing the grass, weeds, and debris. Lay concrete blocks in the soil — four feet apart — before setting your pallets on top. Grab your chairs, decorate, and enjoy! This paver patio project takes a bit more patience, but it will pay off. You'll first clear the area and tamp the soil so it's firm and level. Lay landscape fabric, crushed stones, and sand over the area to prevent weeds from peeking through the stones. Then it's time to lay the pavers. You can rent a brick cutter or just lay whole bricks and stones. Whatever you do, position pavers no more than ⅛ inch apart. Total cost? $550 with all supplies. There's nothing better than listening to the sound of running water outdoors. Try making this DIY garden fountain out of, well, anything. The schematic might look a little intimidating, but it's basically a basin for your water with a pump and decorative "sculpture" that the water flows through. You can find a pump at most garden stores, just make sure you get one that's labeled "submersible." Create a garden out of nothing with this raised garden bed project. This couple built a whopping five cedar beds for around $100. You'll make all your cuts before assembling the boxes using galvanized screws. The mitered frame is completely optional, but it definitely gives the beds that finished touch. Then excavate the ground, fill with dirt, and get planting. My husband and I want to build a fire pit in our backyard. First, you'll want to check with your local government to make sure open flame fires are permitted in your neighborhood. From there, you need a metal ring, retaining wall blocks, drainage gravel, decorative rocks, and outdoor construction adhesive. After choosing your pit's location, you'll dig out the area and tamp the dirt. Lay your gravel around the metal ring. Then surround with the blocks, which you'll fasten together with the adhesive. Get this! You can make these cute stepping stones in a cake pan. No, really. You'll first want to gather some decorative mosaic glass or even smashed china for flair. Cut out a piece of contact paper, and arrange your glass in a pattern inside the pan. Slap on some gloves, mix together concrete, and cut out some metal mesh to give your stone stability. Scoop in a layer of concrete, lay the mesh, and finish with more concrete. Let sit for two days before removing. Many store-bought compost bins cost a pretty penny. This DIY compost bin is well within most anyone's budget at just $5. Heck, you may even have the materials you need sitting in your garage. Take an 18 gallon plastic bin (with top) and drill 5/16 inch holes about two inches apart in all directions. Then add kitchen scraps, leaves, paper, and a scoop of soil to get started. You should have rich compost in around five weeks. Our neighbors' yard (and all their stuff) is right next to our deck. So, we'd love to build a few of these quick privacy screens to give us all some space. The tutorial is so easy, I may even try constructing it completely on my own. And at just $30, I figure it's worth a try. You'll take standard wooden lattice panels and build frames for them. Then screw in some hooks to hang. It's as simple as that. I might paint mine for some extra oomph.